Studies identifying the effect of outsourcing on equalities groups. Published on 26th April 2005. Last updated 6th June 2017. Between 1990 and 1994, Ealing council under conservative control undertook an aggressive strategy of commercialising its public services, taking privatisation and commercialisation to extreme lengths and leaving a lasting legacy of unemployment, low levels of service provision and accountability, and a huge budget deficit. This report documents the devastating nature of such policies, and offers a textbook example of the risks of privatisation and externalisation of public services. Written and researched by Centre for Public Services for Ealing Unison (1994). Briefing which discusses the impact of privatisation and contracting on women and domestic labour (2003). 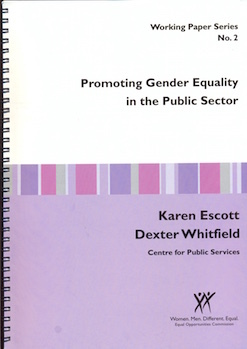 Examines legislative and national contexts and uses several case studies to discuss the approach to gender mainstreaming in Britain and concludes by setting out the case for a public sector duty on gender. This is a summary of a research study carried out for the Equal Opportunities Commission (EOC) into the gender impact of CCT in local government. The study found a number of areas where CCT had a more serious effect upon women’s employment situation than their male counterparts. This summary describes the context and methodology of the research, and presents the key findings of the report. It also contains a series of EOC policy recommendations for public bodies. This report analyzes the implications of privatization for women workers, especially those employed in low-end occupations. Data analyzed show that women disproportionately depend on the public sector for jobs that pay decent wages and offer benefits. This is especially true for African American and Hispanic women, and for women who do not have a college education. In part, higher wages and better access to health and pension benefits in the public sector can be attributed to higher rates of union coverage. The evidence suggests that privatizing government services will have a negative impact on women workers, especially those workers who are most vulnerable.